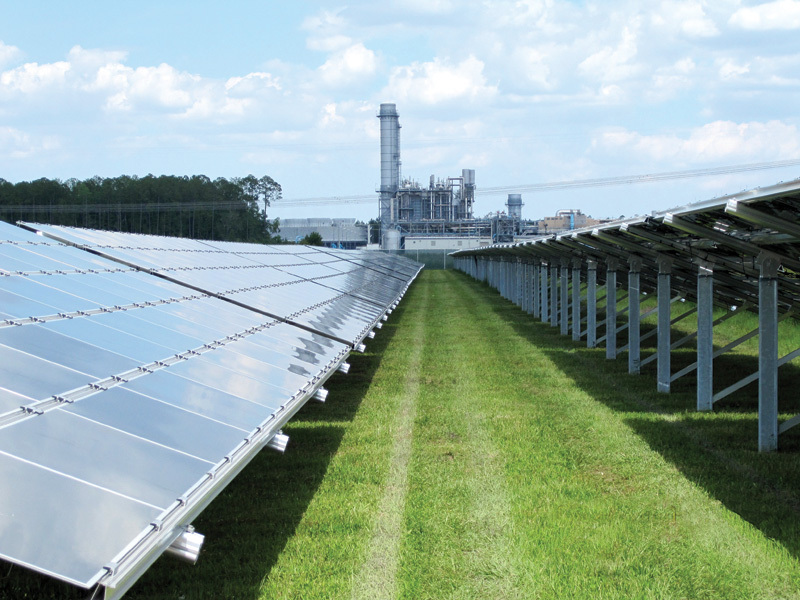 PSEG Solar Source has taken its solar power projects to the next level with its 15 MW solar farm in Jacksonville, Florida, which the company sees as the next step in their "crawl, walk, run" philosophy. "We have a crawl, walk, run philosophy in terms of solar power development," says John Westphal, PSEG Solar Source project manager. And he sees the company’s new 15 megawatt (MW) Jacksonville solar power project as "walking" on the way toward a sprint. "Projects like this help the industry learn how to build bigger projects, which overall reduces costs, with larger economies of scale," says Westphal. 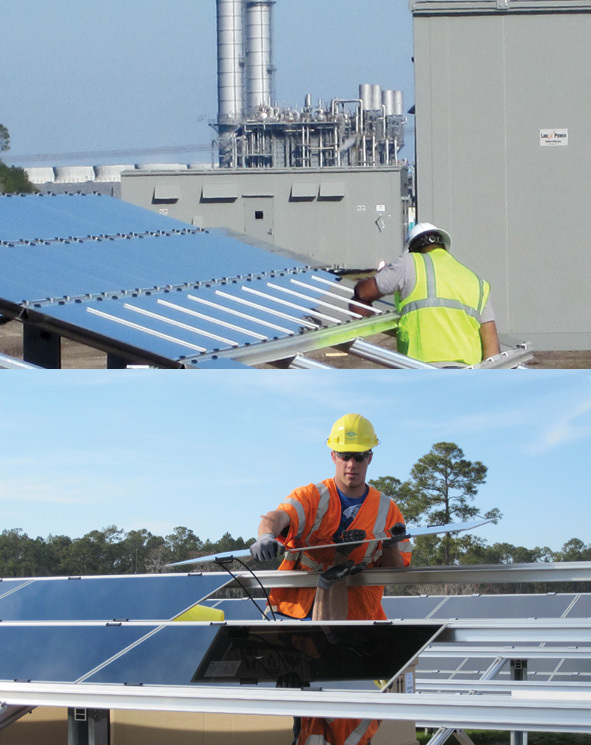 The Jacksonville project began—like many utility scale solar projects—with a Request for Proposals, by the Jacksonville Electric Authority (JEA) in 2008. juwi solar Inc. was awarded the contract in early 2009 and approached PSEG as a potential equity investor and owner of the power purchase agreement. juwi handled the fairly rigorous site permitting process with the City of Jacksonville—with JEA’s support. By October 2009, construction was underway. By April 2010—in just a little over five months—the first SMA inverter was energized. By mid-May, eight of 20 inverters had been energized, and on September 30, the solar farm went into full commercial operation. Energizing inverter by inverter may be a little more time consuming, but Westphal says with a project of this size, that’s the preferred way to do it. You can’t construct a project of this size without a few challenges, though. In this case, a high groundwater table was one issue to overcome. "We’re located close to some wetlands and had to be very careful about how we handled the groundwater, and we made sure we didn’t affect any of the wetlands," says Westphal. PSEG selected a fixed-tilt racking system over a tracking system, based on an engineering economics study done early in the project. The Schletter racking system they selected provided a great deal of pre-fabrication, so that it could be installed with minimal effort in the field. There was extensive permitting required and construction contractors, Miller Electric Company and J.B. Coxwell, handled the issues effectively by laying a system of underground pipes (called "dewatering socks") at key locations on the site. These pipes made it possible to pump the groundwater down from specific areas when required. Westphal says he’s proud that the project came in on time and on budget. "It gives us more knowledge, experience, and confidence to go ahead on larger projects." Or in other words, go from walking to running. There were a number of reasons why this project went smoothly from start to finish. First, PSEG and juwi were able to take advantage of local talent. "The tools and techniques required to construct these plants can be handled by a qualified electrical contractor, who may have never built a large solar plant before. This is because it requires the same techniques: pulling and terminating wires, installing electrical equipment, etc." explains Westphal. "It’s the same things they’d encounter in any other power generation or large industrial project. And in those areas where they do need some specific guidance, juwi is an expert." PSEG also took advantage of innovative technology that made sense for the project—like First Solar panels. Westphal says they went with First Solar for several reasons. "First, there was the cost. They are—per watt installed—a very cost-competitive solution. Also juwi has a long-term relationship with First Solar and are able to leverage that relationship into a very economical package. Lastly, they work better in diffuse sunlight, which you get some of the time in Jacksonville." PSEG also chose a fixed-tilt racking system over a tracking system, based on an engineering economics study done early in the project. "A tracking system adds a lot of cost. You get more energy out of it, but we have to evaluate that against the added cost," says Westphal. The Tucson-Arizona-based Schletter racking system provided a great deal of pre-fabrication, so that it could be installed with minimal effort in the field. "Besides going together very quickly, it also gave us a lot of room for adjustments," adds Westphal. The process of going from crawling to running is sped up with incentives. Unfortunately, this particular project—which came to about $158 per megawatt hour, about twice that of coal—didn’t come with many. "The federal investment tax credit is the primary incentive," says Westphal. "There were also some federal tax rules on depreciation, which benefit capital projects like this as well." But in Florida, there is no renewable portfolio standard or additional incentives for solar. Financing was handled by PSEG, and the project will provide returns through a long term power purchase agreement. "The Jacksonville Electric Authority is purchasing the electricity and all of the solar credits. And they’re buying them at a price that’s sufficient to make the project economical from our perspective," says Westphal. He adds that learning to finance projects of this size is all part of the "crawl, walk, run" philosophy. It helps the industry as a whole learn how to create bigger and more profitable projects in the future. Although the modular nature of the Jacksonville system is fairy unique, juwi applied a process they’ve frequently used in Europe. "It starts with how they install the racking system, how they apply the modules to it, and how they package the inverters and transformers inside a prefabricated power station," says Westphal. "It all gets done in the factory and is then shipped out to the site so that there’s minimal fieldwork. All of these characteristics make it both innovative and cost-effective. And because of that, you’re likely to see more of that kind of construction in the future." 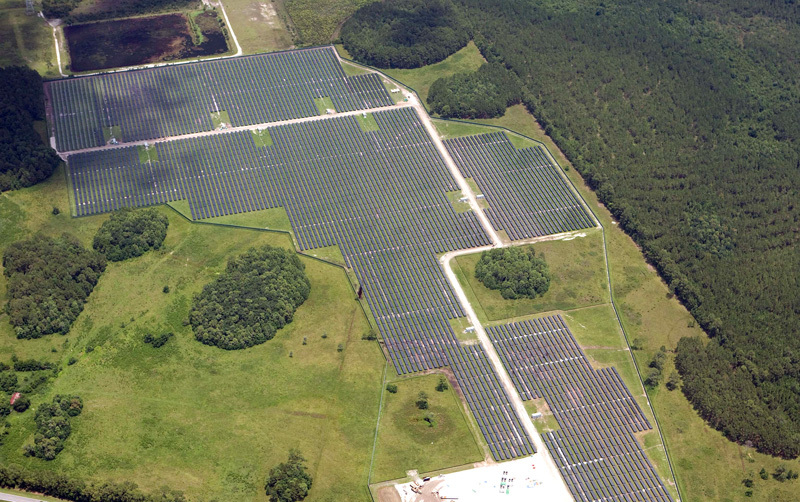 Jacksonville Solar is owned by PSEG Solar Source LLC and consists of approximately 200,000 photovoltaic panels on a 100-acre site. juwi solar, Inc., a Colorado-based developer and turn-key installer of solar power plants, provided the engineering, procurement, and construction services. No one wants problems to happen, but planning for them is part of the juwi system as well. Should a problem crop up, it can be handled both quickly and efficiently. JEA would contact the owner PSEG, who would in turn contact juwi—hired to operate and maintain the facility for the first two years. "We also have remote monitoring," explains Westphal. "We have secure websites we can access that tell us how well the plant is doing versus how it theoretically should be doing, given the weather conditions at the time. It’s pretty sophisticated stuff." PSEG can measure the performance of each of the 20 inverters remotely. Each inverter has a benchmark given the weather and the light. If an inverter is not performing the way it should—if it’s falling short—juwi can then dispatch an electrician and a technician to go out and troubleshoot. "They can even reset some things remotely, if necessary," says Westphal. But what about something big—like hurricanes—not unheard of in the Jacksonville area? "Although hurricanes are possible at this location, they’re not that frequent in the Jacksonville area," says Westphal. "We are about 20 miles inland from the shore so we don’t have to worry about storm surges and that type of thing." High winds have been taken into account, and the panels are more durable than they appear. They are designed to withstand a whole slew of environmental conditions, including golf ball-sized hail and 105 mph winds. With the solar farm performing well, PSEG is stretching its legs to speed up its walk to a run. The company is currently developing a number of projects throughout the U.S. in the medium to large range. "Our first two-megawatt projects were kind of a crawl phase—getting familiar with the technology and the construction aspects," explains Westphal. "The Wyandot, Ohio, and Jacksonville, Florida, projects—12 MW and 15 MW—are part of our walking phase and allowed us to improve our expertise. The run phase will be, hopefully, significantly larger." PSEG is optimistic about the potential market, particularly the utilities sector. The company expects to see continued growth, with accelerated growth in three to five years. "The solar industry has made a lot of strides in driving facility costs down," says Westphal. "We hope to get it to the point where we’re at parity with what most grids are paying for conventional energy. That’s really the end goal for all of the investor sets: the utopia that you can put renewable energy projects in and it doesn’t cost you any more money to build or run than a conventional project." How soon this will happen depends on who you talk to, Westphal says. "Future projects will take advantage of new technologies, which are rapidly developing—changing practically from month to month," he says. "For example, if Jacksonville Electric wanted us to duplicate the project we just completed, we would probably be looking at different inverters, even from the same manufacturer, because they are continually upgrading their product line. And that’s a good thing. We constantly have to keep up with new developments in the industry." In short, part of being successful in the future is staying flexible and being able to take advantage of what a constantly-evolving industry has to offer. That, it turns out, is one of the things PSEG does well. "We’re a pretty progressive company," says Westphal. "Ralph Izzo, our CEO, said early on that climate change was really the pre-eminent challenge facing the industry and because of that, we got into this business to look for alternative means of generating electricity without relying so heavily on fossil fuels." And that’s why they are sprinting ahead.